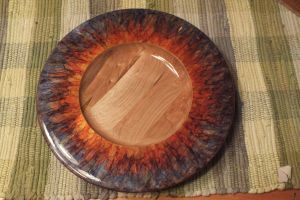 Bob started woodturning in 2010 after having looked at an inherited Rockwell Beaver lathe in his basement for 30 years. He has now upgraded to a used General 26020 with a lot less vibration. 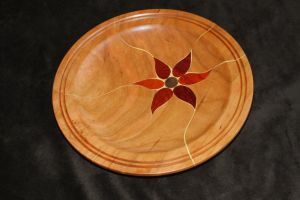 Bob enjoys trying a variety of projects, from bowls to boxes to hollow turning to epoxy inlay platters - using all types of wood, including elm, apple, and maple gathered from the yard. Bob lives on 3.5 acre property just north of Ayton, with nice bright workshop. For more information on Bob's work, you can contact Bob at rdyck@wightman.ca. 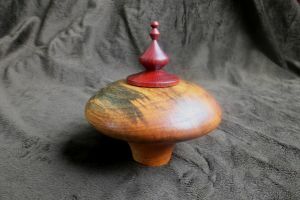 Elm with black ebony epoxy inlay. 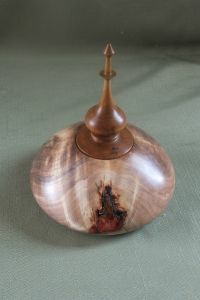 Hollow form with finial lid. 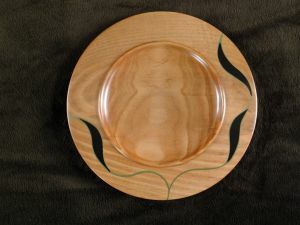 Bandsaw epoxy inlay. 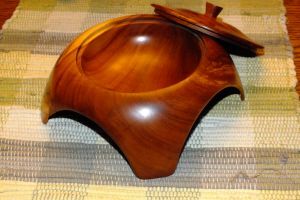 Cherry with padouk.